ExifList displays the Exif tags from an image, Exif being the metadata format most cameras use. 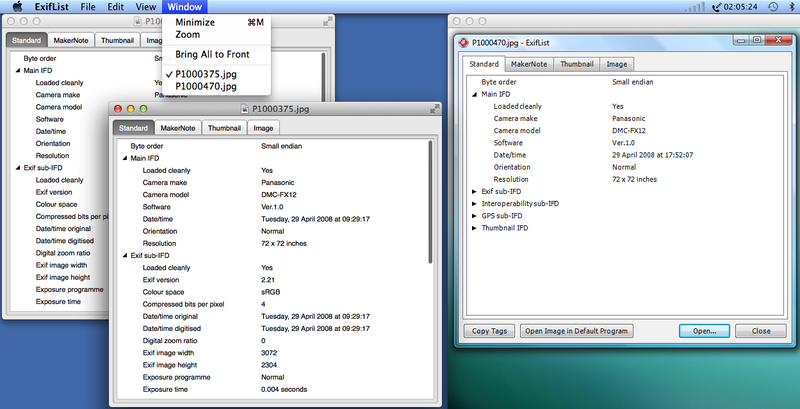 ExifTimeShifter shifts the Exif date/times for one or more images by a specified number of minutes. IPTCEditor edits the IPTC data held in an image. IPTC is the metadata format Photoshop used back in the 1990s, and makes for a slightly lower-tech alternative to Exif. JpegDump displays information from a JPEG file’s header, providing a lower-level view of its metadata tags than the other demos. Screenshooter takes a screenshot, applies a few tags, and saves to a new JPEG file. 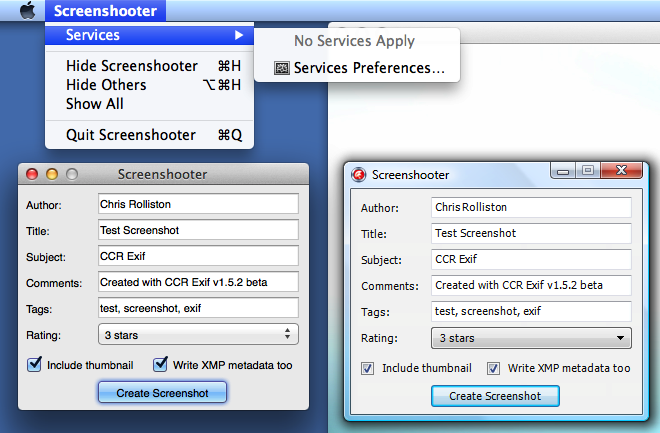 XMPBrowser displays XMP metadata in a tree view, XMP being a newer, XML-based metadata format. While the FMX demos (which require XE3 by the way) mostly hew to the line set by their VCL forebears, I began with a blank slate in each case. This I did because I wanted certain UI details to follow the target platform (i.e., Windows or OS X), and in so doing, see what FMX did to help, or at least, see how far it wouldn’t get in the way. I hide a few toolbar buttons on OS X because toolbars on a Mac just tend to have less items than their Windows equivalents. On both platforms, double clicking a listed file displays the image. 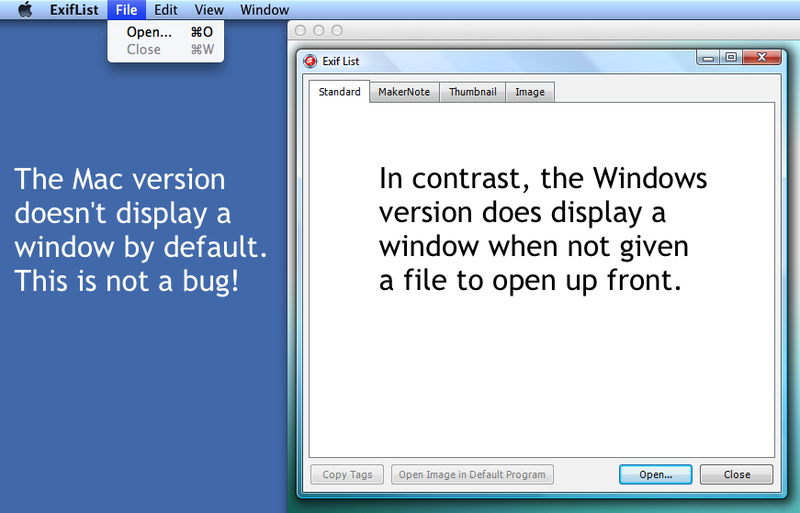 On Windows the image window gets its own taskbar button; on OS X it is full screen-enabled – you can see this in the screenshot with the double arrow icon on the title bar – and listed under the application’s Window menu. While I had to implement these things manually, it wasn’t hard, though I’d admit the Windows part requires more work (the FMX developers are unfortunately obsessed with a Win 3.x/VCL-style ‘main form’ concept that isn’t technically native even on Windows). The file date/time preference is saved to the Registry on Windows and the application’s preferences file on OS X. Since I didn’t want to introduce dependencies, the latter is done by direct API calls, though in practice I would use my own Mac Preferences API wrapper I blogged about previously. Each demo is essentially single source, and structured around my preferred VCL UI model. In this, the document form’s OnClick code is all centralised into action lists located on a data module separate from the form itself, with any necessary communication between the actions and the form being performed via interface types. A unit shared between all the demos (CCR.FMX.Demos.pas) then contains all the platform-specific UI-related code, and manages the differences between the different document models (no form is auto-created in the traditional Delphi fashion, and the document form class itself is looked up using RTTI). Alas, but that unit also implements certain crucial bug fixes for FMX itself, though at least the new IFMXxxxService system (see my previous-but-one post) made that bareable. I’ll probably blog about it in more detail later. Rather belatedly, given the code has been sitting in the SVN trunk for many months, I’ve finalised a new ‘stable’ release of my image metadata reading/writing library, CCR Exif (despite its name, it has some support for IPTC and XMP metadata too). If people using it have been updating from the Google Code repository, the only real change is the removal of the word ‘beta’ from the file headers, however I did put through an important bug fix concerning XMP writing not so long ago. I’ve also put up a new ZIP file for people who prefer that, however I would recommend using the SVN repository instead (I only commit bug fixes and structural changes I’m sure I won’t reverse). 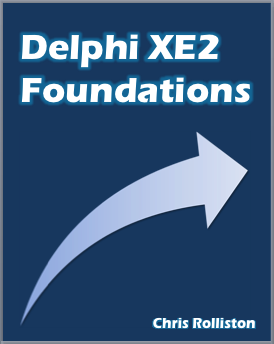 Going forward, I won’t be supporting the Delphi 2006 compiler any more, and possibly later ones too – we’ll see. This 1.5.1 version will still be available for old compilers however. I was going to get round to it eventually, though having an explicit request prompted me to actually do it: updating my open source image metadata reading/writing library (CCR Exif) to properly support XE2. The updates I’ve just posted to Google Code has it cross compiling for each of Delphi XE2’s three DCC-targeting platforms, Win32, Win64 and OS X; it should also still compile back to D2006, though at least D2007, and preferably D2009 are preferred. On the downside, iOS isn’t supported because the code remains as Delphi-specific as ever (and no, FPC 2.6.0 doesn’t help much). Also, there aren’t any FireMonkey demos as yet, though the console ones all cross compile if you have XE2 and add OS X as a target platform. In practical terms, Win64 took as long as it took to add ‘Win64’ as a target for each of the demos; OS X was somewhat longer for a mixture of reasons, primarily because the code had some entanglement with the VCL graphics classes, and there’s no ‘clean’ way for the same code to work with both VCL and FMX on that score. By far the biggest waste of time effort was managing project files across an array of Delphi versions though, with battling Subversion a close second, i.e. not actual coding at all. As I wanted to make running the demos as newbie-friendly as possible, I’ve ended up with separate project files for D2006, D2007, D2009-10 and XE+ – just open the appropriate project group located at the top of the trunk and do a Project|Compile All. If compiling under D2007 or later, executables will then be outputted in a sub-directory off the Bin folder next to the individual projects, and DCUs in a ‘DCUs’ folder off of the main trunk. Anyhow, the Google Code page is here; if using the File|Open From Version Control… command in the XE or XE2 IDE, the URL to enter is http://ccr-exif.googlecode.com/svn/trunk/; choose either Console Demos (XE+).groupproj or VCL Demos (XE+).groupproj as appropriate when prompted.